A simple execution of complex designs is the key to beauty. In the battle for higher numbers of standard features, safety regulations, and ipad screen navigation systems, the interior of the automobile autonomous place. Back in the day, car interiors were like MySpace pages. A simply line of code copied and pasted onto an editing screen enabled for flashy backgrounds and elements of a user’s attitude to make it onto the page. Then Facebook came out and standardized the social media experience, and just like that the annoying graphics were gone. The same happened with car interiors, and while it helped to eliminate some of the nuisances that old and poorly designed interiors had, it also killed off a lot of creativity. However Horatio Pagani isn’t a man who is fazed by industry trends. Through a masterful blend of art and science, Pagani combines 21st century technology and 16th century art and styling to create the cockpit of the Huayra. 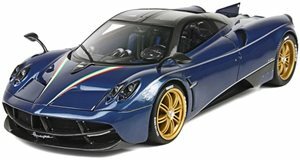 After a glance inside, it’s no wonder that Pagani claims that the interior of the Huayra will “transport occupants to a new dimension.” So how is the inside of this $1,314,000 car ? To make things easier, let’s break things down by elements. A few primary materials make up the cabin; aluminum, titanium, carbon fiber, and leather. Simplicity is key inside the Huayra, but just like John Lennon can make a masterpiece using only his voice and a guitar, Pagani out of the bare minimums. Like almost every other piece of metal in the car, the housing for the Huayra’s gauges is milled out of a single piece of aluminum. The carbon-fiber dash frame is also a single piece. In fact, the lightweight material was chosen because it can be left hollow and remain stiff. This allows the air conditioning system to blow air inside of the carbon-fiber dash frame and out through the vents, which saves weight on extra pipes for the a/c system. This process goes on unseen by the driver but is all kinds of cool, just like the Huayra’s other interior features. Aluminum pedals and a carbon fiber bracket on which the seat rests, both pieces that won’t spend much time under the scrutiny of an art critic, are made beautiful because Pagani wanted to make sure that if a driver loses a coin under the seat, they will be treated to a visual surprise when they go to look for it. Details were important, so of course the central components like the leather are hugely prized. For that, Pagani wanted an impossible combination of softness equal to that of a lady's handbag and durability for everyday usage. A year and hundreds of tests was what it took to to meet these demands. If that isn't enough, Pagani guarantees that spares can be reproduced to match the interior in case anything happens to the leather. Knickknacks are also central for a $1 million car. One of these is an overhead switch box that features a red launch control switch, because who doesn’t want an overhead switch with the word “Launch” written on it. A metal shifter made of 67 exposed parts is present inside to make the car more of a ceremony. Without impeding on the driving experience, Pagani has managed to make one of the most attractive automotive interiors using minimal materials. Carbon fiber serves as the structure, the movable switches are made of metal, and the places where the driver rests on are all soft yet durable leather. For the million-dollar price, no less should be expected, but even this interior is overdone competition.